Who really was more highly civilized—the Incas or some of the peoples who preceded them? While it is unquestionable that the Incas were the greatest stonemasons and road builders, they could not hold a candle to the Moche in their artwork. Look at the faces above: They are remarkably individualized, especially the one to the right. 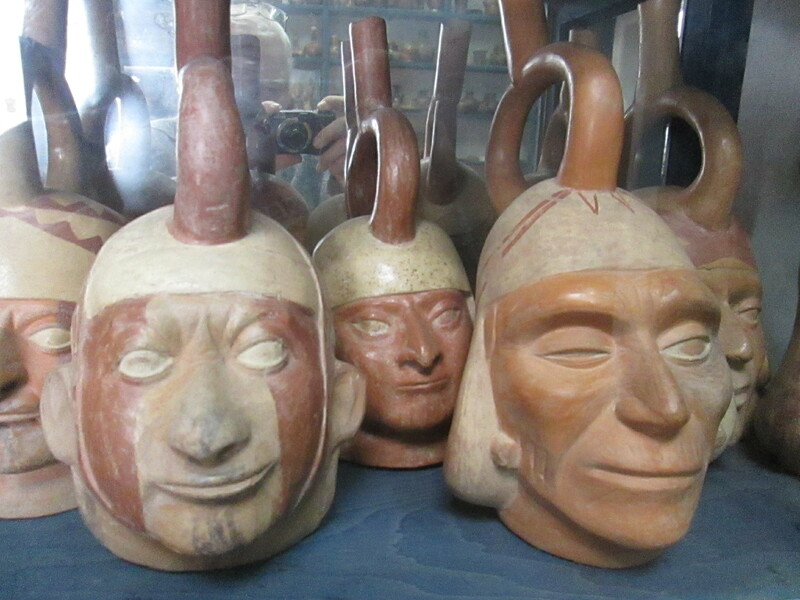 If you should find yourself in Lima, I would highly recommend a visit to the Museo Larco in Pueblo Libre. Dedicated primarily to Moche ceramics and metal-working, it is a phenomenal collection, originally put together by Rafael Larco Hoyle in Northern Peru. It is a delightful place to spend several hours, especially if one eats at the museum’s excellent restaurant. (Try the tiraditos.) After visiting the Museo Larco, you could follow the painted blue line on the sidewalk for some twenty minutes or so and end up at the Museo Nacional de Arqueología Antropología e Historia del Perú, with its excellent exhibition on the Paracas Culture. The Incas were, in their time, an up-and-coming military power that conquered most of Peru, Bolivia, Ecuador, and parts of Chile. In the process they supplanted many talented peoples who were set to working raising crops and building roads and structures. Gone forever were the brilliant ceramics. Fortunately, enough was left to leave a brilliant picture of a culture that flourished from 100 to 800 AD, centuries before the Inca rose to power.